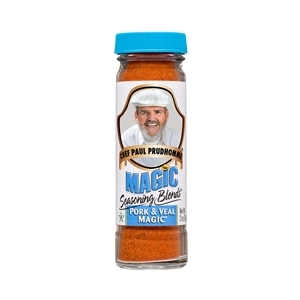 Use Pork and Veal Magic® to give great flavor to roasted, broiled, grilled, bronzed or blackened pork, veal and lamb. Easy to use in stews and casseroles. Substitute for normal use of salt, pepper and other herbs & spices called for in a recipe. Magic Seasonings are versatile in their application and pack incredible depth of flavor. Contains no MSG or preservatives and is Kosher approved.